Craniosacral therapy is a method of evaluating and dissipating restriction in the central nervous system by focusing on the physiological body system called the craniosacral system. The craniosacral system consists of the membranes and cerebrospinal fluid that surround, protect and maintain the environment around the brain and spinal cord. This includes the bones of the skull, face and mouth (the cranium) down the spine to the tailbone (or sacrum). Proper functioning of this system is vital and an imbalance or dysfunction can cause sensory, motor and/or neurological dysfunctions. Like the pulse of the cardiovascular system, the craniosacral system has a rhythm, called the cranial wave. This constant wave movement of the cerebrospinal fluid is as critical to life as the movement of blood throughout the body. Small flexion and extension movement of the cranial bones and sacrum maintain this circulation. Restrictions in any part of the system can result in inadequate flow to that area of the brain or spinal cord. Those who suffer from chronic symptoms that have not been resolved by other approaches are among the largest group of CST clients. Clients report relief from a wide range of problems associated with chronic pain, central nervous system and autoimmune disorders. Recent reports have highlighted craniosacral therapy for the positive results for children with chronic ear infections or learning disabilities. Using extremely sensitive touch, (generally no heavier than the weight of a nickel,) skilled practitioners evaluate and locate the source of a restriction. Having identified a restriction, the therapist can help the body self-correct by working with the natural movement of the related soft tissue, particularly the fascia. Pregnancy and childbirth can be complicated by a mother’s previous injuries, even minor childhood and sporting injuries. Craniosacral therapy is used to address the discomforts of pregnancy and work toward balance in the mother’s pelvis during pregnancy. Mothers report an improved sense of wellness, easier labors and improved birth outcomes. Often discomforts we think are just part of pregnancy result from an imbalance in the mother’s body that can be addressed by CST. Relief from the discomfort can often be achieved and restoring balance to a mother’s body will help avoid complications at birth. The extremely light touch involved makes CST a safe and effective technique for children, infants and newborns. Infants especially can benefit from the timely identification and release of restrictions in the craniosacral system, thereby helping prevent future difficulties such as learning disabilities or hyperactivity. Early indications for care include nursing difficulties, colic, and digestive difficulties such as reflux and constipation. Often intrauterine positioning or minor difficulties during the birth process can result in distortions in the cranial bones and/or connective tissues in the body of a newborn. Cranial molding is completely normal and necessary at birth but should be resolved within two days after birth. Babies who have asymmetry of the cranial bones after two days may be likely to have nursing or digestive difficulties. These are also babies who often develop colic when they begin to grow and the restrictions become more noticeable. Parents should expect to learn techniques to help their baby continue to work out minor restrictions throughout the rough and tumble toddler and early childhood years. 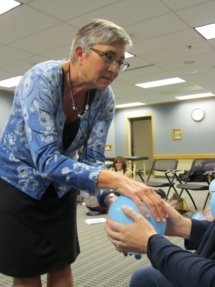 Debra works with people of all ages to help them improve their physical and emotional health and wellness. Your first appointment will be a much longer appointment that subsequent visits. For adults you will be with us for and hour and a half to two hours (for children under the age of 10 the visit will be approximately one hour). During this time we will discuss your heath history, answer questions about craniosacral therapy, do a complete evaluation and then treat the whole body. You will be fully clothed, so please do wear comfortable clothing that makes it easy for your body to move. At the end of the session you will be given suggestions of “homework,” generally stretches or activities, to make the most of your session. We will discuss recommendations and schedule your next appointment. Generally we recommend that you plan to have 3 or 4 sessions about 1 week apart to maximize the success of the body work we will be doing together. In most cases the distortions in the body have been present for an extended period and it will take a series of sessions to achieve and maintain balance. Also, the more you are able to follow through with the recommended “homework” the more successful you will be in achieving your goals. Often craniosacral therapy is combined with other therapies, such as chiropractic care or physical therapy, to achieve optimal function and health.